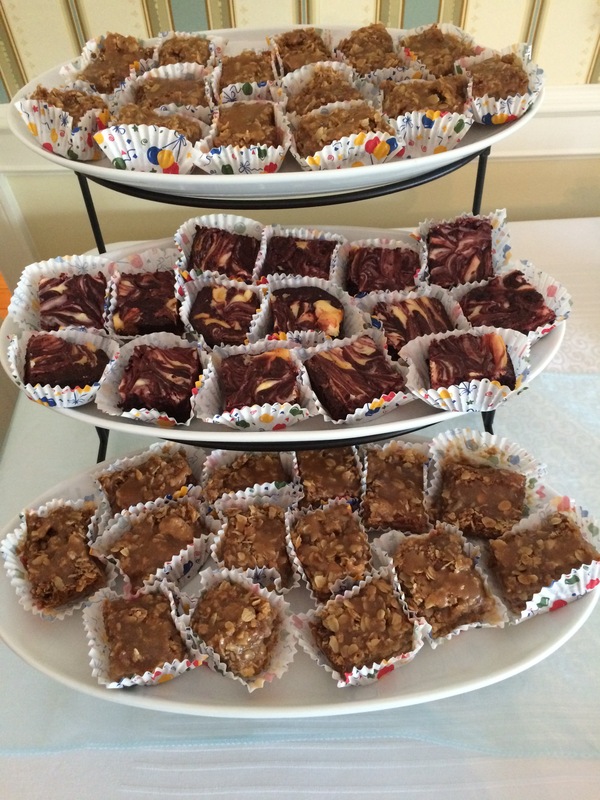 I made these bars for my sister-in-law’s baby shower along with red velvet cheesecake swirl brownies. If you like apple pie, you will love these. They are phenomenal and so easy to make. My mother-in-law said that I could make these for her any time and kept the leftovers in the refrigerator for later consumption. This is the best way to store them. If you leave them out of the fridge, the bars end up getting a little bit mushy (but still delicious). The crust is ridiculously easy to put together and spread in the pan. It was actually so good and so easy that I wondered if I could just use it as a crust for pies. Based on recipes found here and here. Note that the recipe is for an 8″ x 8″ baking pan, but I doubled the recipe in the pictures for a 13″ x 9″ baking pan. For the crust: Preheat oven to 300 degrees. Line an 8″ x 8″ baking pan with aluminum foil, leaving an overhang on each side. Set aside. In a medium bowl, stir the melted butter, sugar, vanilla, and salt together. Press the mixture evenly into the prepared baking pan. Bake 15 minutes. For the apple filling: While the crust is baking, combine apples, flour, sugar, cinnamon, and nutmeg in a large bowl until the apples are evenly coated. Set aside. For the streusel: Whisk oats, brown sugar, cinnamon, and flour together in a medium bowl. Cut in the chilled butter until the mixture resembles coarse crumbs. Set aside. For the pre-bake assembly: Remove crust from the oven and turn up the temperature to 350 degrees. Pour the apples over the crust, making sure to create a tightly-pressed, even layer. Sprinkle the apple layer with the streusel. Bake for 30-35 minutes, or until the streusel is golden brown. Allow to cool for at least 20 minutes, then refrigerate for at least 2 hours. For the caramel sauce: While the baking pan is cooling in the refrigerator, heat granulated sugar in a medium saucepan over medium heat, stirring constantly with a high heat resistant spatula (if not, pieces will melt off into the sauce) or wooden spoon. The sugar will form clumps and eventually melt into a thick, amber-colored liquid. Keep stirring, being careful not to burn. Once sugar is completely melted, add the butter. The caramel will bubble rapidly. Stir butter into mixture until it is completely melted, 2-3 minutes. Slowly drizzle in the heavy cream while stirring. The mixture will rapidly bubble/splatter again. Allow mixture to boil for one minute. Remove saucepan from the heat and add the salt. Allow to cool. For the post-bake assembly: Remove the chilled pan from the refrigerator. Lift the foil out of the pan and cut into squares. 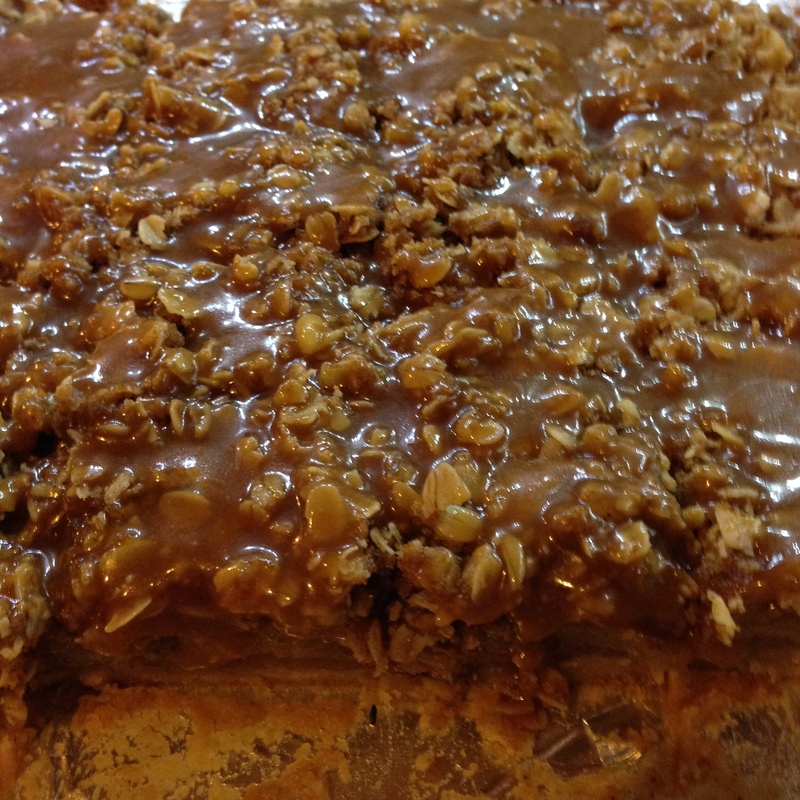 Drizzle the caramel sauce on top of the squares.